SNP MP and member of the Defence Select Committee Martin Docherty-Hughes MP has said that the Ten Minute Rule Bill in his name is aimed at giving service personnel ‘one strong voice’. 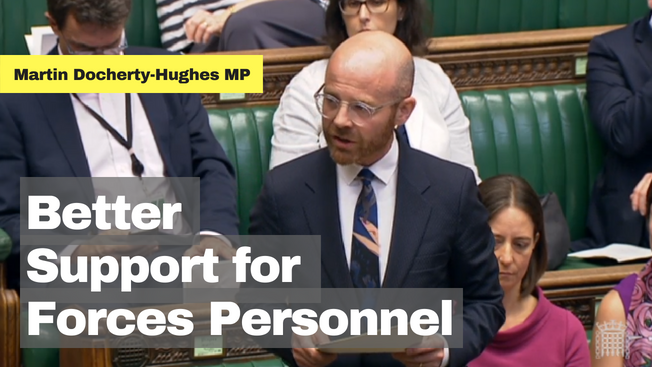 Mr Docherty Hughes’ Bill – presented at Westminster today (Wednesday) is calling for the introduction of an Armed Forces Representative Body on a statutory footing and Mr Docherty-Hughes has said it is a ‘vital step to ensure that Armed Forces personnel can improve their working and economic conditions’. The Bill would seek to create a body, similar to Police Federations, that would represent serving personnel as employees, advocate for improvements in pay and conditions, offer support in personal and social matters, and make representations to the chain of command: although crucially, just like the Police Federation, this would not allow them to strike. Currently, those serving are not permitted to participate in any political activity, and while membership of sectoral or interest groups is permitted, and the Service Complaints Commissioner oversees complaints made, broader service interests are represented by a patchwork of organisations, including the three service family federations, there is no single body representing the UK’s Forces service personnel. ‘’My Bill is entirely focussed on the interests of service personnel and their families – which I believe are best represented when they speak with one strong voice, and on issues like the 1% pay freeze, or ongoing worries about the state or service accommodation, it would be a vital step to ensure that Armed Forces personnel can improve their working and economic conditions. ‘’The worries I have heard expressed are the same across all three services and are particularly acute, with recent inflation meaning all service personnel have been experiencing what is in real terms a Tory wage cut. The UK has an excellent network of service and families charities whose sterling efforts in representing their members has not gone unnoticed – but this Bill is clearly needed. ‘’The Bill would also make a difference to conditions for serving personnel, something that many fear the Tories have simply discarded. It is imperative that the neglect that allowed for the widespread and well-documenting equipment shortages during the Iraq and Afghanistan conflicts must not be repeated.